Tokyo Silk is the brand of silk products made by the premium cocoons produced in Tokyo prefecture mainly around the Tama area. “Tokyo Silk Association” originated from “Tama Silk Life 21 Study Group” was established with the aim to sustain domestic silk production which had declined enormously since the period of the greatest productivity. The cocoons of Tokyo Silk Association are raised by the seven silk farmers who are left in Tokyo Prefecture. By the use of special filature method known as Namaguri (reeling fresh/ unprocessed cocoons), authentic luster and elasticity endowed originally in natural cocoons are restored to become Tokyo Silk’s various textile products. Tokyo Silk presents high quality silk which is completely domestic and raised in the nature and culture of the Tama area. The filature method of Namaguri* which operates exclusively at a slower speed in, prevents the introduction of stress or damage during the procedure of silk yarn-making and produces the feature of Tokyo Silk, fluffy and soft, purely white with an elegantly beautiful luster. It gives those wearing it a feeling of luxury and satisfaction. Cocoons are carefully nurtured by farmers, and transformed into well-loved products crafted by the members of Tokyo Silk Association. 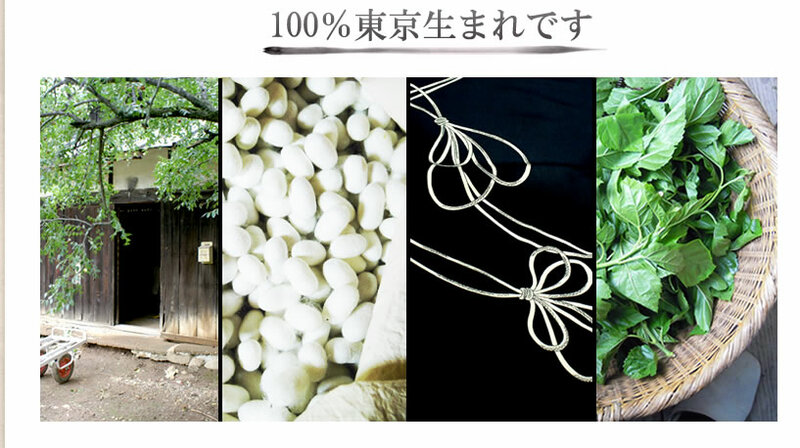 ※Namaguri : Cocoons are reeled while still fresh without oven-drying, thus preserving the original property of silk. 1992 “Exhibition of Science and Technology ’92 and Silk Festival” was held by Tokyo University of Agriculture and Technology at the Department of Technology. 1995 “Tama Silk Life 21 Study Group” was established. 2000 The brand “Tokyo Silk” was stipulated that the products are made by completely domestic silk produced in Tokyo prefecture. Tokyo Silk proves its high quality with confidence to deliver comfort. The quality of Tokyo Silk was certified as being the most superior; accordingly Grade 5A was given by the Foundation of Gunma Prefectural Council for Evaluation of Cocoon Quality. Tokyo Silk holds an exhibition once every two years to introduce local residents to our activities and knowledge about silk. We produce various breeds of cocoons, but our premium kind is Aojyuku, which is so delicate with a filament that is about 1.3 denier (a half of the thickness of common cocoons). Kimono and Kijaku (fabric for kimono) made by Tokyo Silk. “3rd Tokyo Silk Exhibition”. Tokyo Silk products are produced by artisan’s developed skills, such as twisting and plying yarns, weaving, braiding, and dyeing. 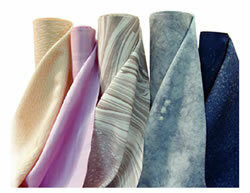 Tokyo Silk products have a shine that reflects that of a pearl, and are without doubt of excellent quality. 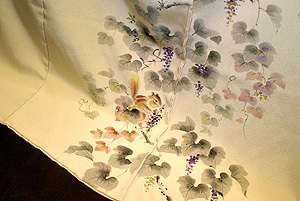 The true value of silk is said to appear when the fabrics are put on and felt. Our products provide excellent performance when they are worn. The products are designed from the standpoints of customers, and they are manufactured through close collaboration among farmers, filature mills, spinners, weavers, and dyers. Tokyo Silk is transformed into various excellent products according to each artisan’s specialty, which include kimono, obi, kumihimo and other traditional costume accessories, western-styled clothing, shawls, scarves, bobbin races, sweaters, and various other crafts.